I'm an astrophotographer who's been capturing high resolution photos of Mars with my telescope and webcam. The Mars Atlas app has helped me enormously to identify specific features in my images such as Candor Chasma and Valles Marineris. I especially like the identification of very small features like Airy Crater which measures only 25 miles wide. Also the app provides a longitude and latitude grid with numerical values which helps in knowing exactly where one is for any selected time. One can flip the image so that North or South is up and turn the labels and long/lat grid on or off. One may choose a real time update so that the globe rotates slowly with the passage of time or one may freeze the time at any user selected day, hour, and minute. 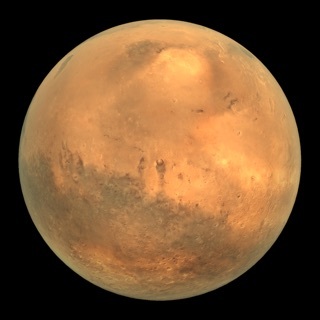 The view of Mars can be chosen as the planet would be seen from Earth or as a freely rotable globe. The phase of Mars may be turned on or off. This app was worth every penny and offers great educational value. This is an adequate app, but for six dollars I would expect higher resolution imagery. I zoomed into Gale Crater to look at the area where the upcoming Curiosity rover will be landing and was disappointed to see nothing but a mass of pixels. Unless you need offline functionality you're probably better off just using a NASA website. I'm not sure this is worth $5.99 in it's current state. I've never understood why globes are so expensive. It appears this app follows that tradition. This is a great interactive, zoomable globe, but not much more. I'll pass on a few ideas. I hope your first rev adds some interesting new features.